Over Thanksgiving weekend, the first of the structures were delivered, insulated, and solar installed. 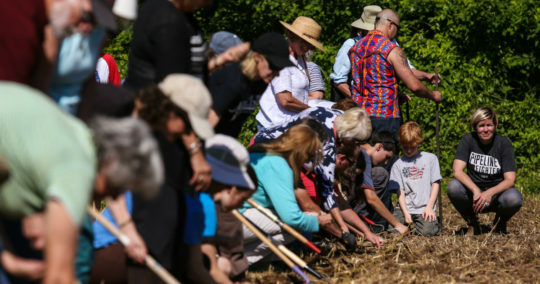 “Everybody recognized right away — ‘wait a minute, we can charge our devices with this?’ And so about a dozen people just sort of showed up all of a sudden and said ‘hey, can I plug in my phone real quick and get a charge off that,'” Scott Williams, a volunteer with BOLD Nebraska, told NTV Nebraska.TV. 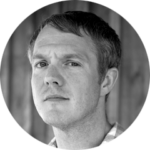 “Everybody is interested in communicating and telling people about their experiences at Standing Rock, and our communication devices all need to continuously be refilled, with electricity, with energy,” said Scott. “We were there to support them. 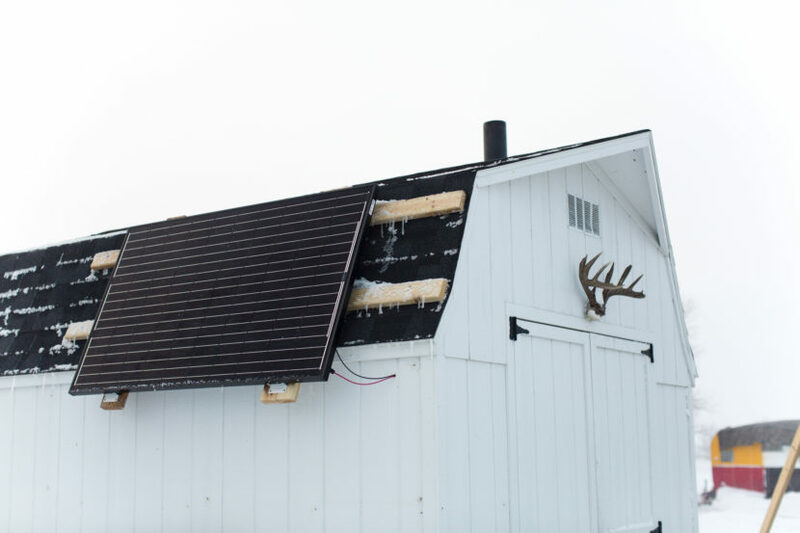 The solar equipment provides light in the tiny barns. It’s got USB ports to help charge phones and other devices,” added brother Eric Williams. 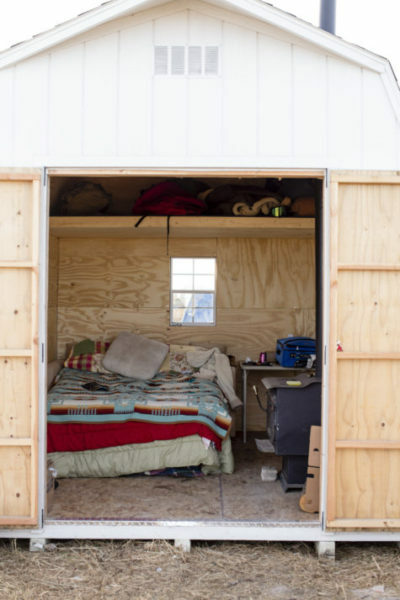 Some of the tiny solar barns will have a permanent home at the new winter camp being established at Standing Rock, while others may be mobilized to help shelter Water Protectors engaged on the frontlines of other pipeline fights across the country. What’s next for the Water Protectors at Standing Rock? 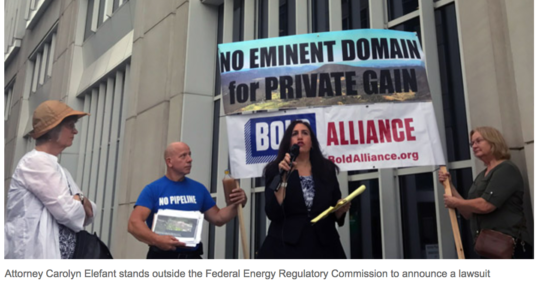 The Sierra Club published an insightful guide on the various court proceedings, the camps, the Army Corps and DAPL finances. 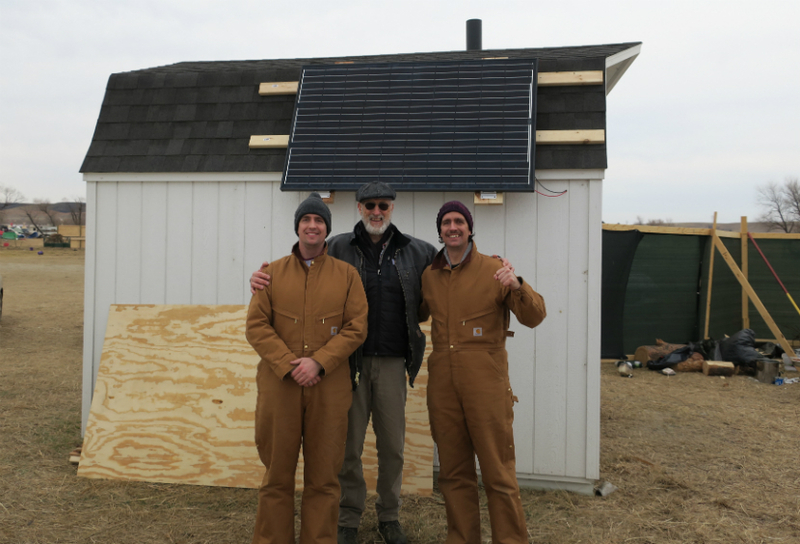 Brothers Eric and Scott Williams of Omaha (pictured with actor and activist James Cromwell) traveled to Standing Rock to help insulate and install solar on the donated tiny solar barns. 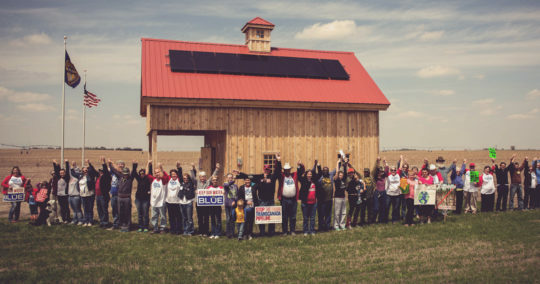 WATCH: The Young Turks (TYT Politics) speaks with Bold Oklahoma’s Mekasi Camp Horinek, filmmaker Josh Fox, and actor and activist James Cromwell about the tiny solar barns at Standing Rock. WATCH: Eric Williams, a volunteer with Bold Nebraska, demonstrates how to install the solar panels on the tiny barns donated to shelter Water Protectors at Standing Rock. Let there be (solar-powered) light! 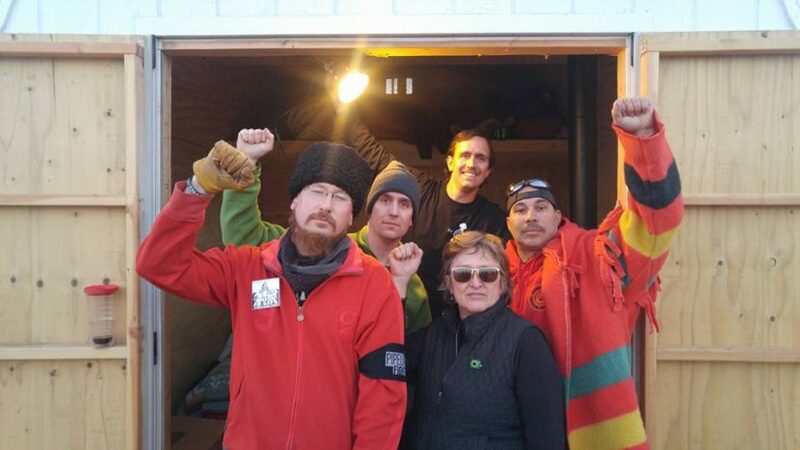 Nebraska Water Protectors & Pipeline Fighters Mahmud Fitil, brothers Eric and Scott Williams, Julie Nichols and Bold Oklahoma’s Mekasi Camp Horinek with a tiny solar barn at Standing Rock. 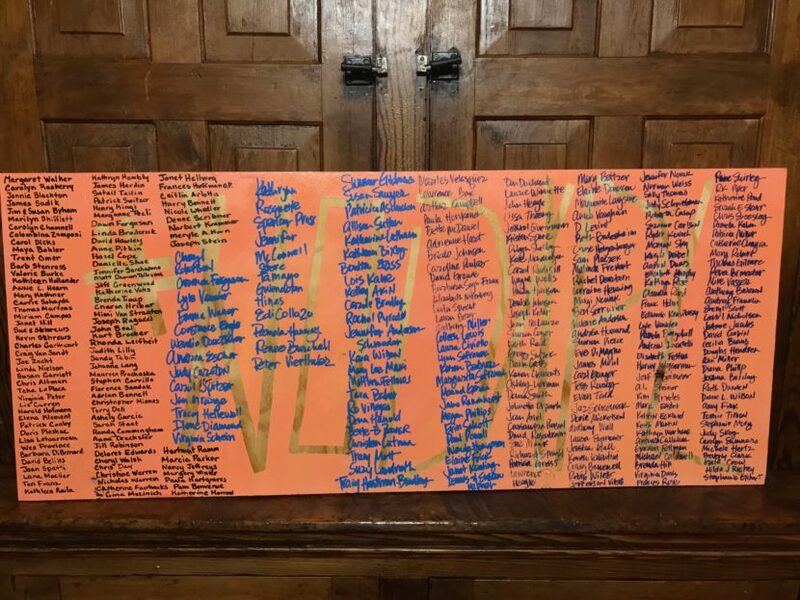 Sicangu Lakota artist Steve Tamayo created the signs that will accompany the tiny solar barns at the new winter camp being established by Water Protectors at Standing Rock, and include the names of all who donated to the fundraiser. 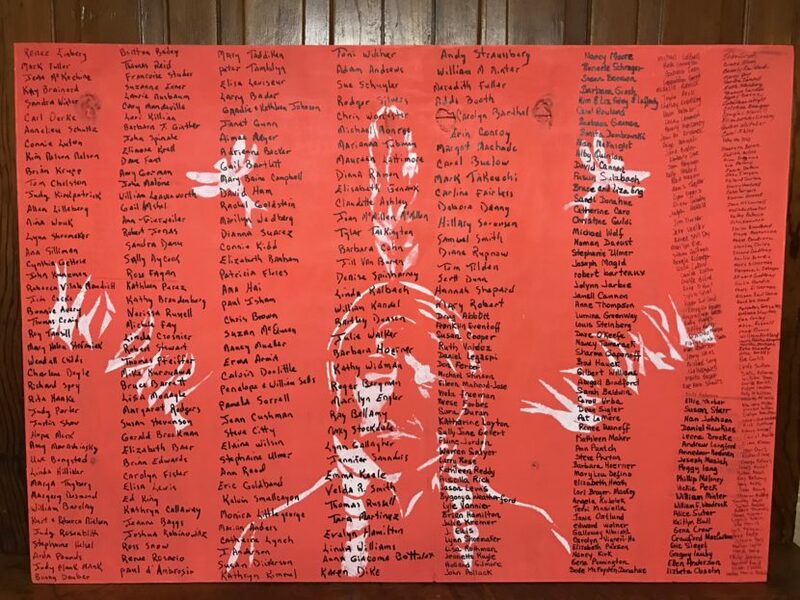 Panel 1 of the sign created by Sicangu Lakota artist Steve Tamayo to accompany the tiny solar barns at Standing Rock, including the names of the 1,300+ donors who contributed to the project. 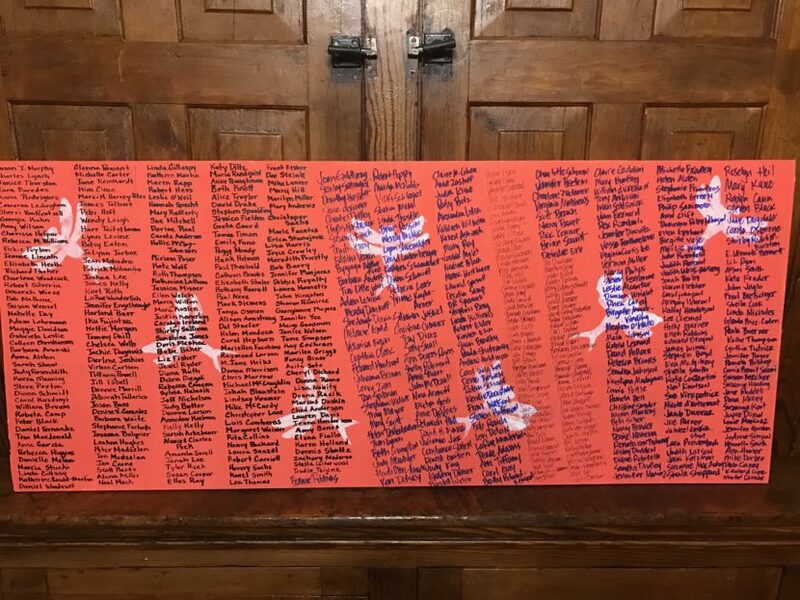 Panel 2 of the sign created by Sicangu Lakota artist Steve Tamayo to accompany the tiny solar barns at Standing Rock, including the names of the 1,300+ donors who contributed to the project. 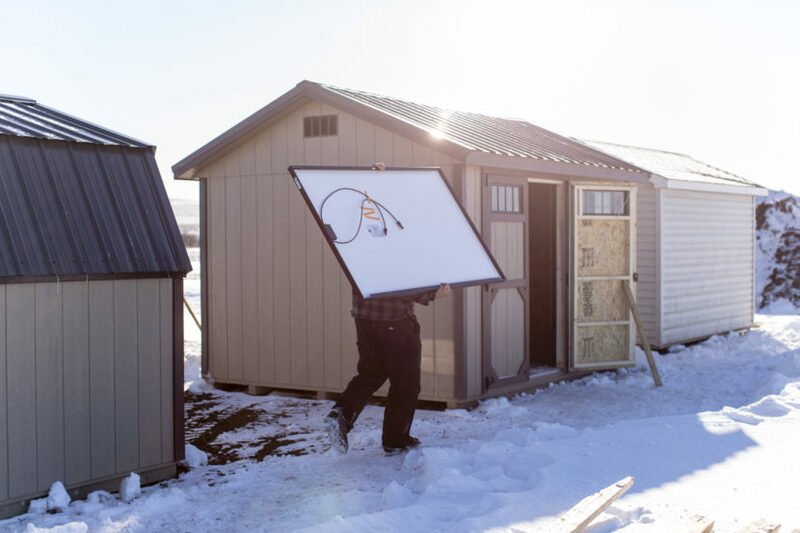 Panel 3 of the sign created by Sicangu Lakota artist Steve Tamayo to accompany the tiny solar barns at Standing Rock, including the names of the 1,300+ donors who contributed to the project. 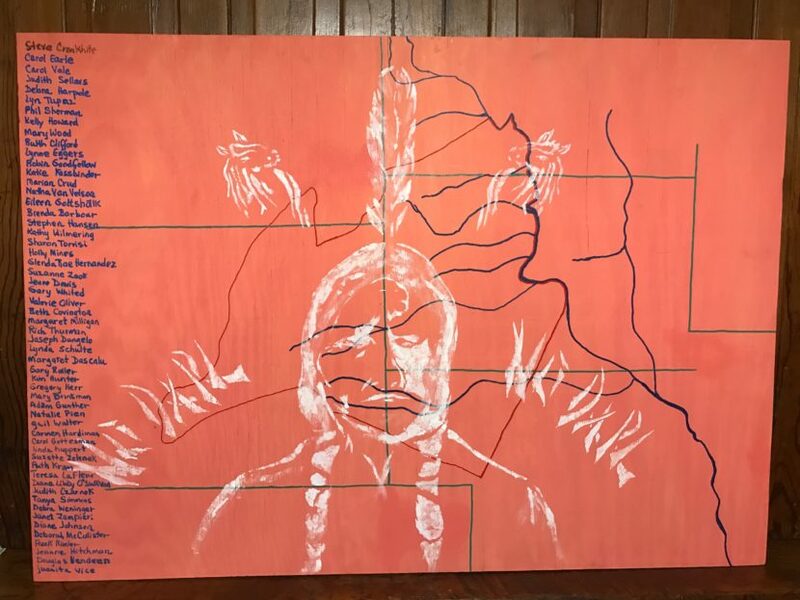 Panel 4 of the sign created by Sicangu Lakota artist Steve Tamayo to accompany the tiny solar barns at Standing Rock, including the names of the 1,300+ donors who contributed to the project.